On 7 February, Bonhams will hold its annual Paris auction, Les Grandes Marques du Monde au Grand Palais under the imposing wrought-iron domes of the Grand Palais. The 2019 sale marks Bonhams 8th sale at the landmark Parisian building, and will feature some of the most sought-after classic, collectors', and competition motor cars in the world. Several of the most desirable lots in the sale are landmark examples from the finest German marques in the world. 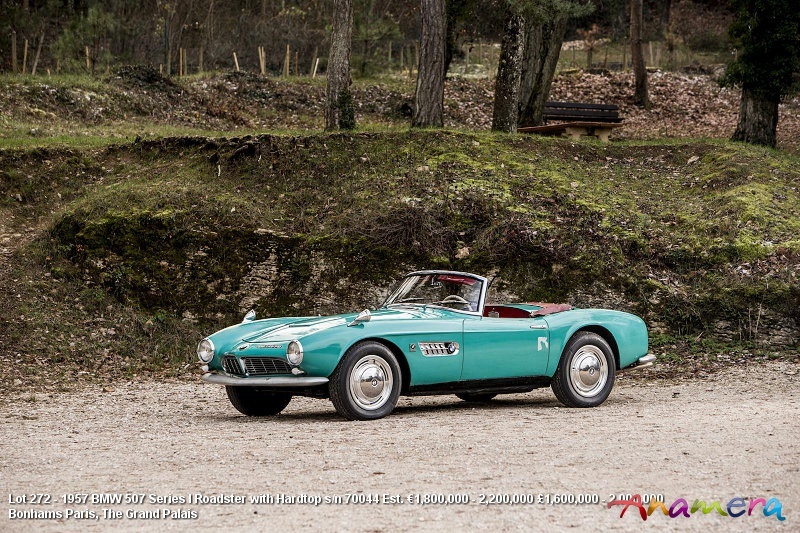 The 1957 BMW 507 is a Series 1 example (€1,800,000 - 2,200,000), meaning that it is eligible for some of the most prestigious events in the world including the Mille Miglia and the Tour Auto. It is one of only 34 Series 1 examples built and has matching numbers throughout. The interior is delightfully original, and the engine is effectively 'as new.' The eye-catching teal exterior makes this one of the most distinctive and attractive examples of BMW's most beautiful model. A second masterpiece of German engineering is the 1939 Mercedes-Benz 540 K Cabriolet A (€1,700,000 - 2,300,000) that was originally owned by HRH King Hussein of Jordan and is being offered directly by his family. The rarest of the Cabriolet examples built by the German marque, the 'A' has the shortest chassis, lending the stately and imposing car a slightly sleeker silhouette. Arguably one of the most recognizable and desirable classic cars in existence is the Mercedes-Benz Gullwing. The 1958 Mercedes-Benz 300 SL 'Gullwing' Coupé (€1,100,000-1,500,000) offered is in immaculate concours-ready condition and is believed to be the only Gullwing in the world fitted with a new factory-supplied aluminum engine. It has been exhibited and taken part in some of the most prestigious motoring events in the world including the Concours Arts et Elegance Richard Mille in Chantilly, the Flying Stars exhibition at Mercedes-Benz Paris showroom and the Spain Rally FIA. A variety of important Porsches are included in the sale, such as the blisteringly fast 1997 Porsche Ruf CTR2 - for many years the fastest production vehicle in existence. Capable of reaching 69pm in under 3.5 seconds and with a top speed of 220mph, this is arguably the ultimate 90's performance car. It outperformed the Ferrari F50, Jaguar's XJ220 and equaled the astonishing Nissan R390 GT1. Rare, exotic and dazzlingly powerful. A second interesting offering from the Stuttgart marque is the timeless 1950 Porsche 356 Split-Window 'Four Digit' Coupé (€800,000-1,100,000), a concours-ready example of one of the most iconic sports cars ever created. This seriously rare split windscreen version is thought to be one of only 30 survivors and has won prizes across Europe such as 'Most Iconic Car' at the Zoute Concours d'Elegance and 'Best Restoration' at InterClassics Brussels. It is in absolutely original condition and would make a remarkable addition to any collection.